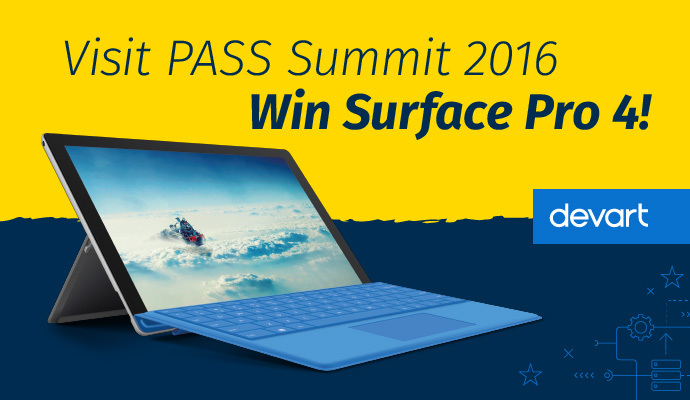 We are more than happy to announce that our team is going to attend PASS Summit 2016. The event will take place on October 25 – 28 in Seattle, WA, USA. Whether you are a data novice or a professional, PASS Summit is the place to find industry-leading speakers, in-depth training, technical tips and tricks, and connections to take your career to the next level. The Chance to Win a Prize! Yeah, this year we are going to raffle Microsoft Surface 4 Pro (128GB / Intel Core i5). Additionally, you have a chance to win a FREE license for our SQL Server tools: dbForge Studio for SQL Server and dbForge Developer Bundle for SQL Server. All you need to do is just to fill a card with your personal info and wait until the raffle begins!